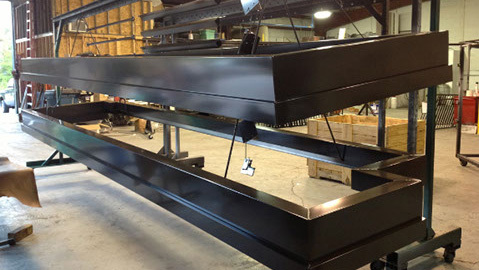 Elite Custom Coatings handles all sizes of industrial coating and industrial painting projects, as well as industrial powder coating. Our dedicated work ethic shows in our outstanding attention to detail and use of only the highest quality materials. Our industrial painting standards exceed government project requirements. We aim to exceed your expectations with every finished project. Additionally, we have expanded our facility to include a 40′ paint booth to handle oversize industrial coating projects. Here at our state of the art facility in Raleigh, we have three wet coat painting booths as well as one of the largest industrial powder ovens in the state. There are virtually no limits to the size of project that we can complete for your industrial application. We are fully prepared to accommodate all sizes and quantities for any project that you may have. From powder to wet coatings Elite Custom Coatings is here to meet your industrial painting needs. You can trust our highly knowledgeable team to make sure your projects receive the correct coating for the application. Give us a call today at (919) 662-8777.